This fresh, yummy dish reminds me a little of chicken marsala, a few similar flavors. Goes well with mashed potatoes and sauted asparagus or fresh steamed broccoli. Marinate the chicken in balsamic vinegar for about 30 minutes. Saute chicken in enough olive oil just to keep the pan and chicken coated. Saute chicken until cooked; and plate. 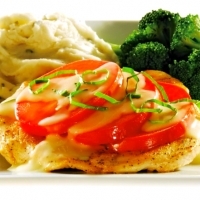 Place your 3 slices of tomatoe on top of chicken breast. Lower heat to low. Add heavy whipping cream, and simmer for about 3 minutes to thicken the sauce, now add your cubed butter, whisking all ingreidents together constantly. Once sauce is hot and thicker consistency, pull from stove top and top over the plated chicken. Fresh Basil on top of the chicken. Serve with garlic mashed potatoes and fresh steemed broccoli, or sauted asparagus. I'm about to make this for the first time what type of heavy cream do you use? Sounds lovely! Thanks for the post. This sounds good, but do you really mean one POUND of butter? Like shesariot267's recipes? Never miss an upload!